MOSCOW — Russian lawmakers, moving to further restrict freedom of speech, passed bills on Thursday that would introduce jail terms and fines for insulting the government online or spreading so-called fake news. The bills are seen as an effort to pre-empt and control public criticism as Russia’s prolonged economic stagnation pushes down the Kremlin’s approval ratings. They reflect a nearly two-decade-long project by President Vladimir V. Putin to put information flow under state control, a push made more difficult by the growth of the internet. The new measures await final passage in the upper chamber of parliament and Mr. Putin’s signature. He has expressed support for restrictions against insulting the state online. One set of bills passed by the lower house, the Duma, would subject private individuals to fines of up to $ 3,000 or 15 days of administrative arrest for insulting the government online. Individuals would face fines of up to $ 6,000 for posting what is termed fake news. The measures did not stipulate clearly what would be considered fake news. The authors said in interviews that this would be determined by state prosecutors and the government communications watchdog. Critics said that the measures were loosely defined to allow the government to block any information online that it finds undesirable. As more Russians switch from television — largely controlled by the state or Kremlin allies — to the internet as their main source of information, the government has made keeping the web under its control a top priority. In February, lawmakers proposed creating the infrastructure to separate Russia from the global internet altogether. Last year, the state banned Telegram, a popular messaging app. The Russian government has opened its assault on so-called fake news even as the United States has accused Moscow of engaging in the practice itself, through a disinformation campaign that was intended to sway the 2016 American presidential election. The new bills were passed as Russians’ trust in government agencies and Mr. Putin in particular has been steadily declining. For the first time since the annexation of Crimea in 2014, the number of Russians who say that the country is heading in the wrong direction has surpassed those who say the opposite. The finding came in a poll conducted in January by the independent pollster Levada. 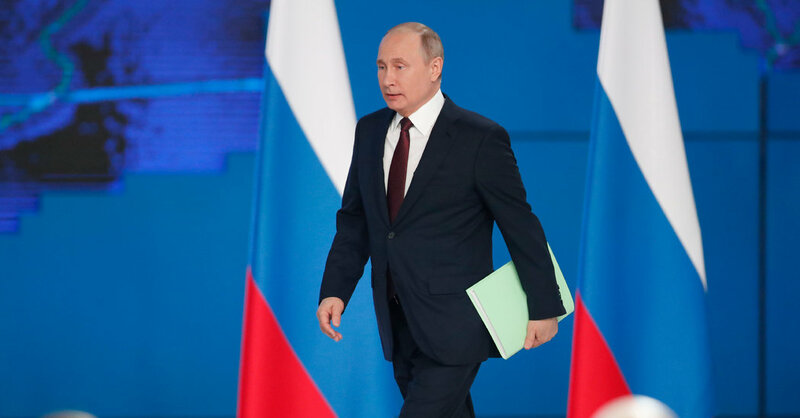 The share of people who approve of Mr. Putin’s work as president has declined by about 20 percentage points since it reached a post-Crimea peak of 86 percent in 2015.